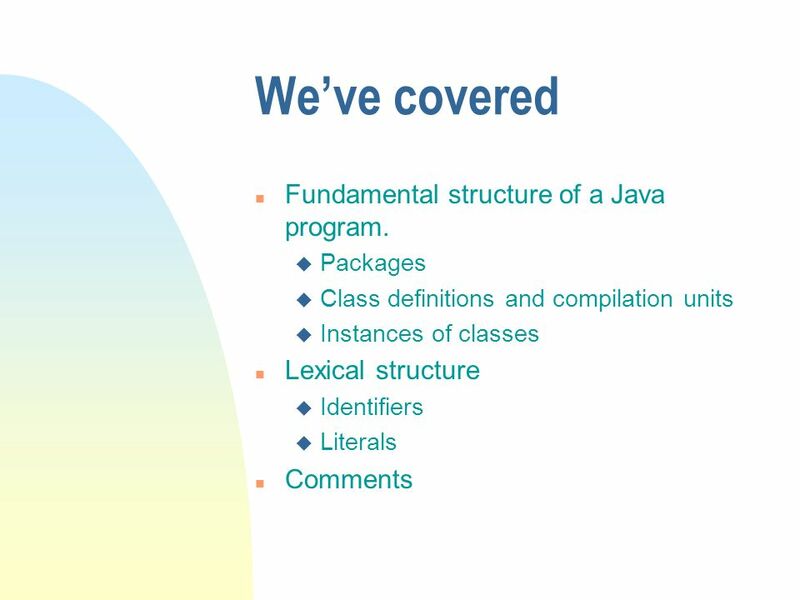 Chapter 3 Basic Java structural components. 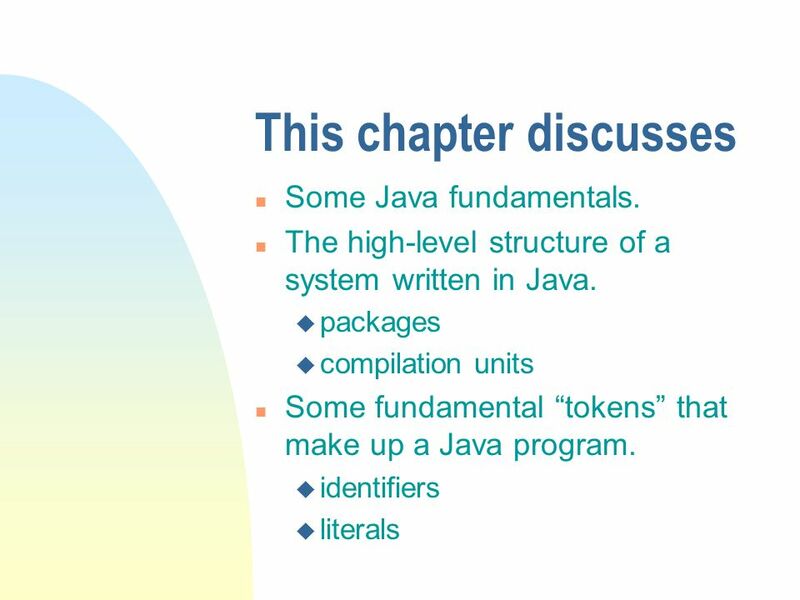 This chapter discusses n Some Java fundamentals. n The high-level structure of a system written in Java. u. 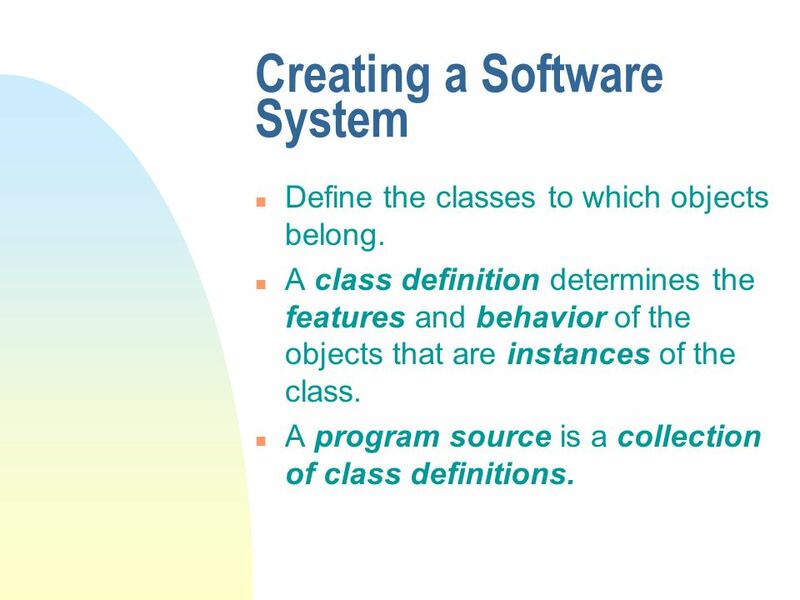 3 Creating a Software System n Define the classes to which objects belong. 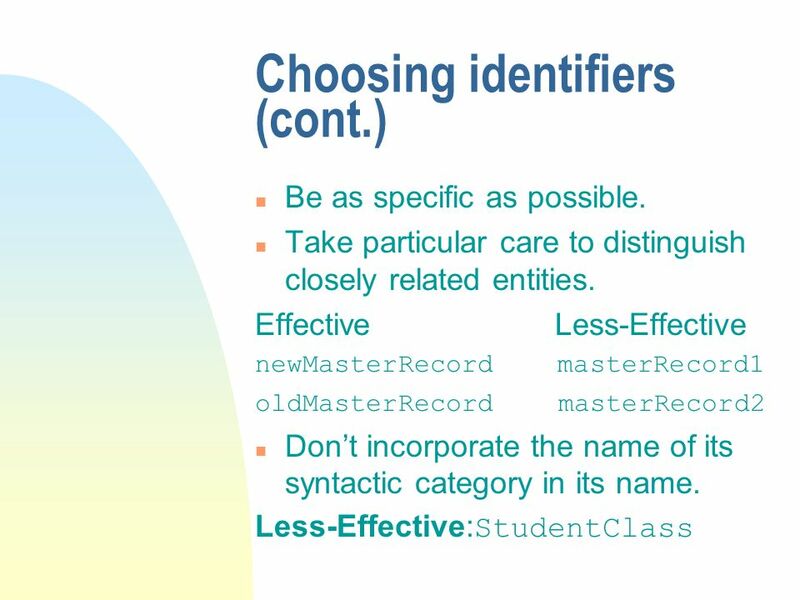 n A class definition determines the features and behavior of the objects that are instances of the class. 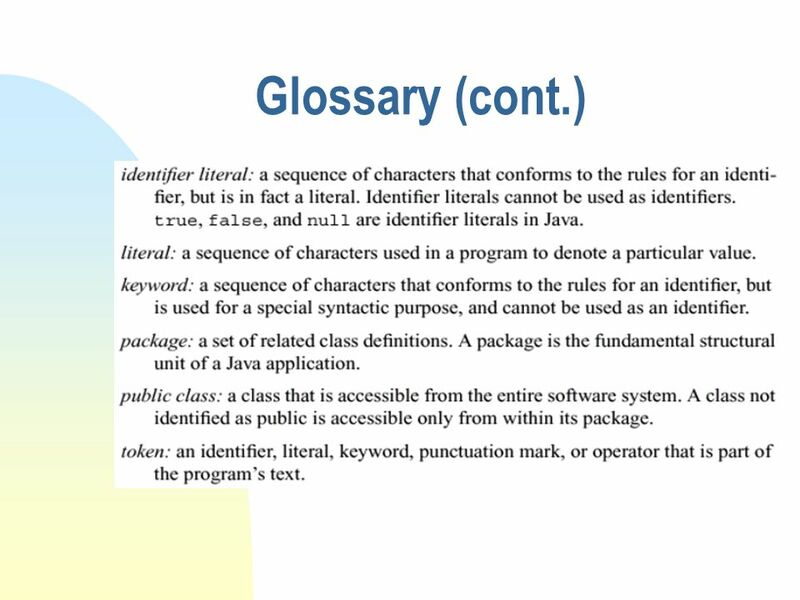 n A program source is a collection of class definitions. 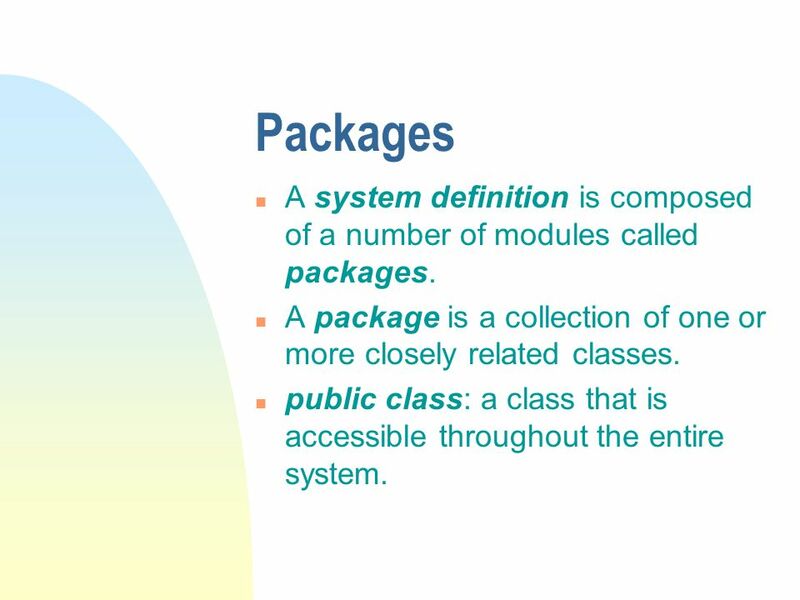 4 Packages n A system definition is composed of a number of modules called packages. 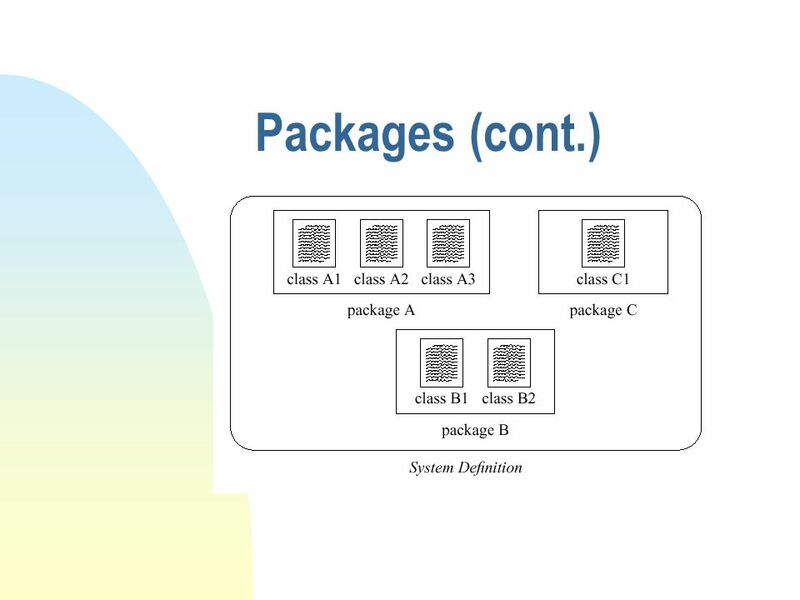 n A package is a collection of one or more closely related classes. 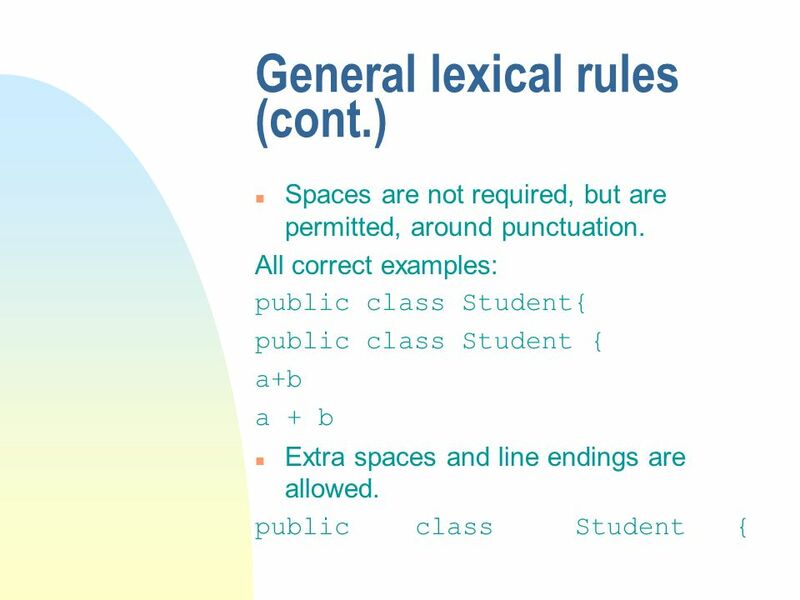 n public class: a class that is accessible throughout the entire system. 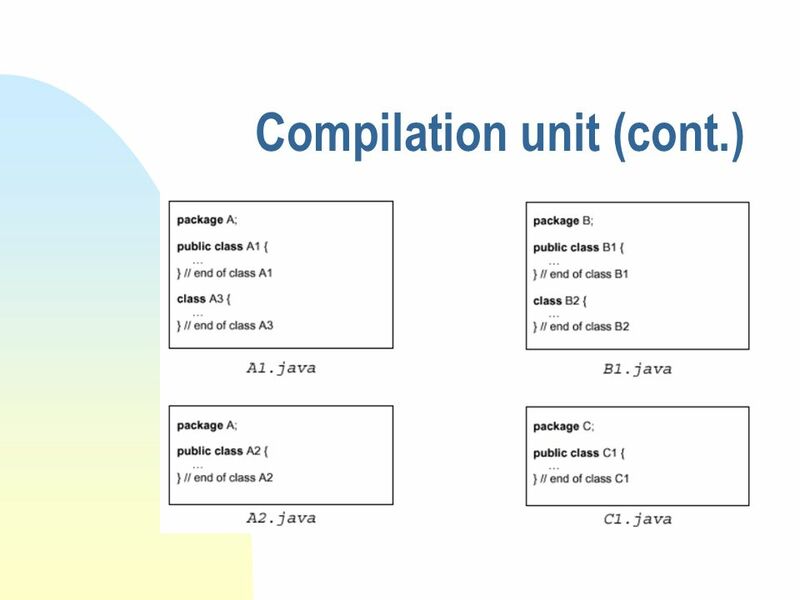 6 Compilation unit n A source file containing the definition of one or more classes of a package. 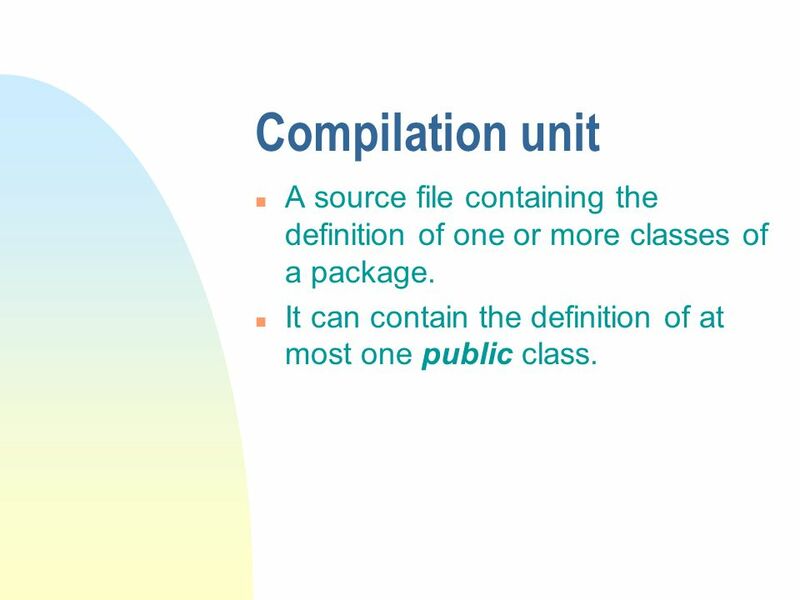 n It can contain the definition of at most one public class. 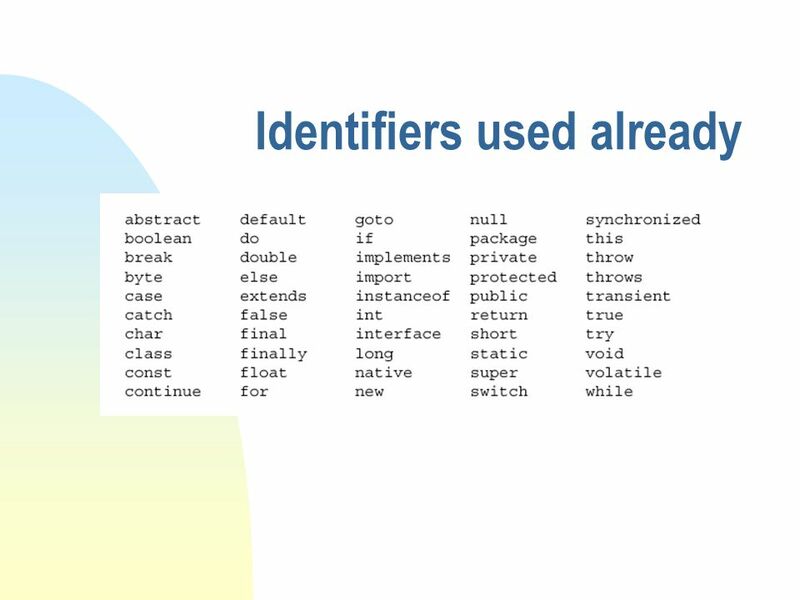 9 Identifiers (cont.) 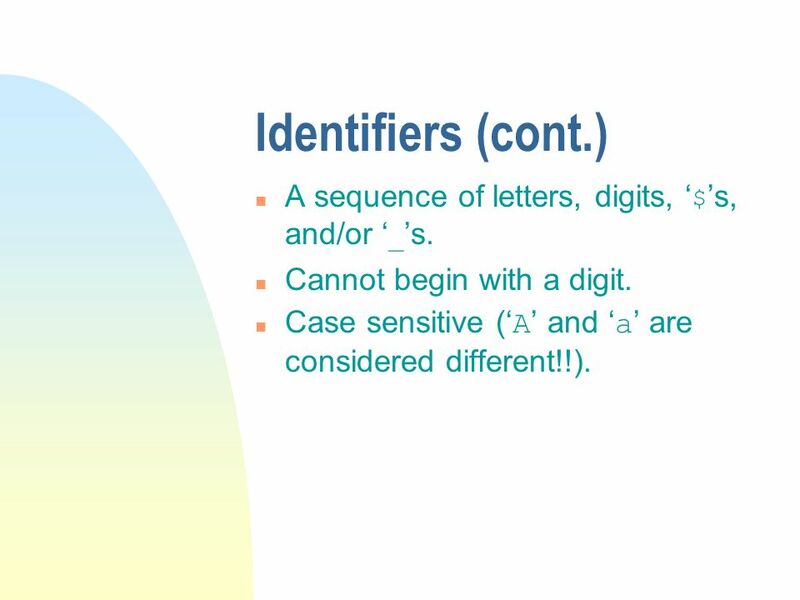 A sequence of letters, digits, $ s, and/or _ s. n Cannot begin with a digit. 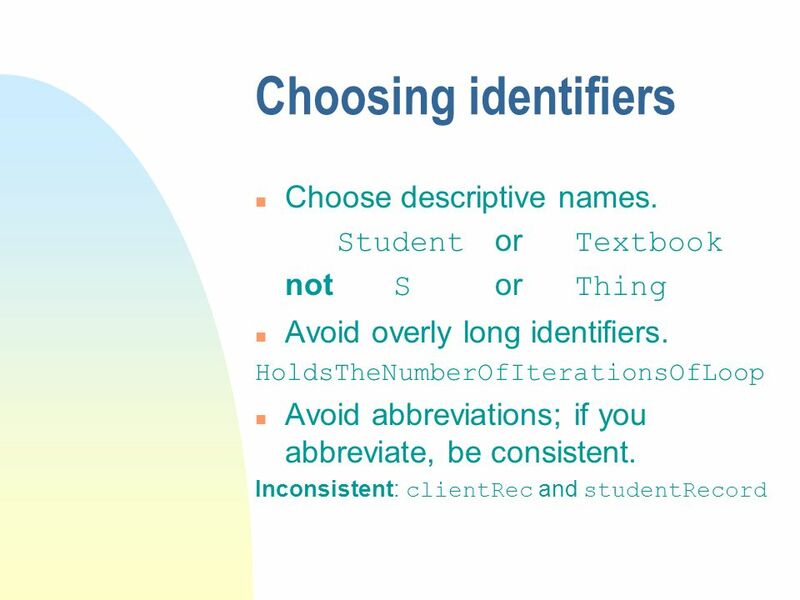 Case sensitive ( A and a are considered different!!). 14 Literals n Sequences of characters that denote particular values. 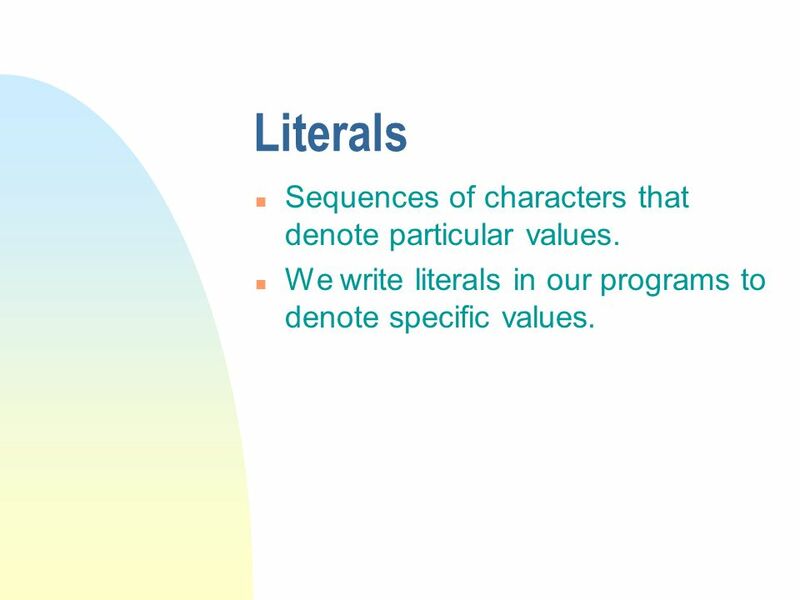 n We write literals in our programs to denote specific values. 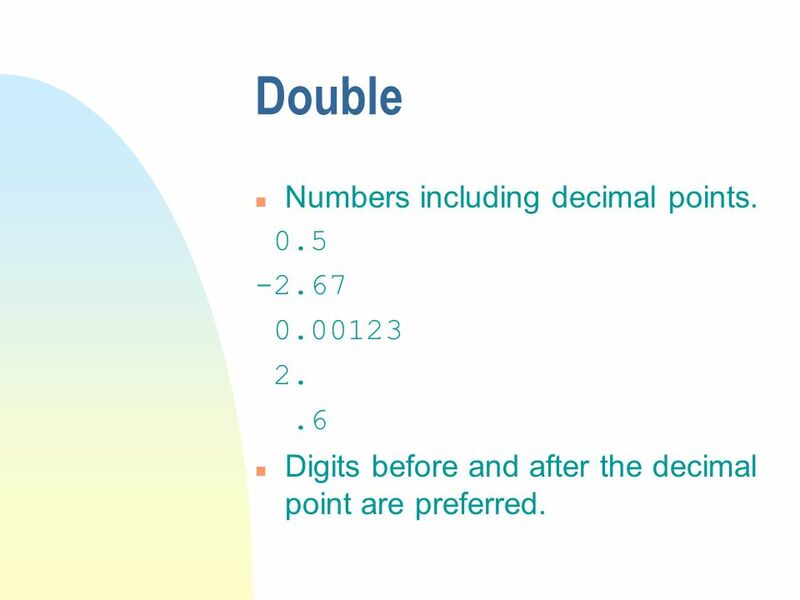 16 Double n Numbers including decimal points. 0.5 -2.67 0.00123 2..6 n Digits before and after the decimal point are preferred. 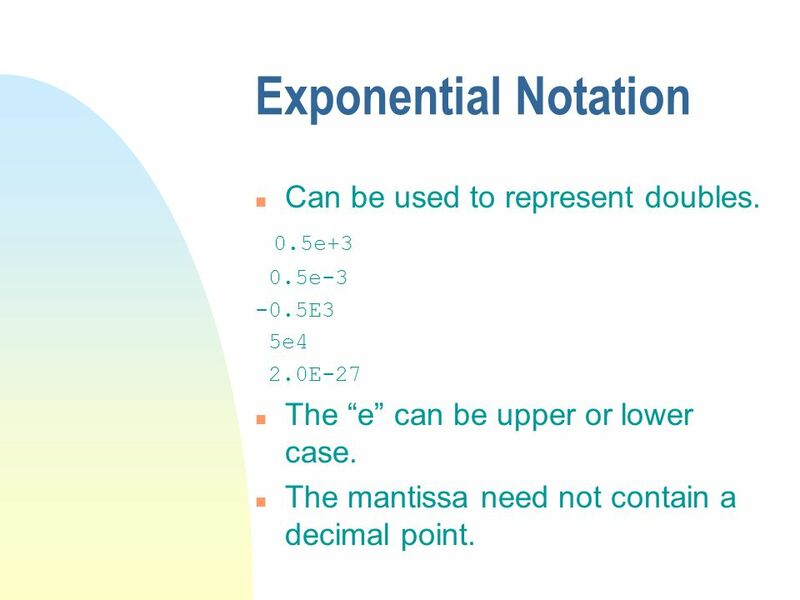 17 Exponential Notation n Can be used to represent doubles. 0.5e+3 0.5e-3 -0.5E3 5e4 2.0E-27 n The e can be upper or lower case. n The mantissa need not contain a decimal point. 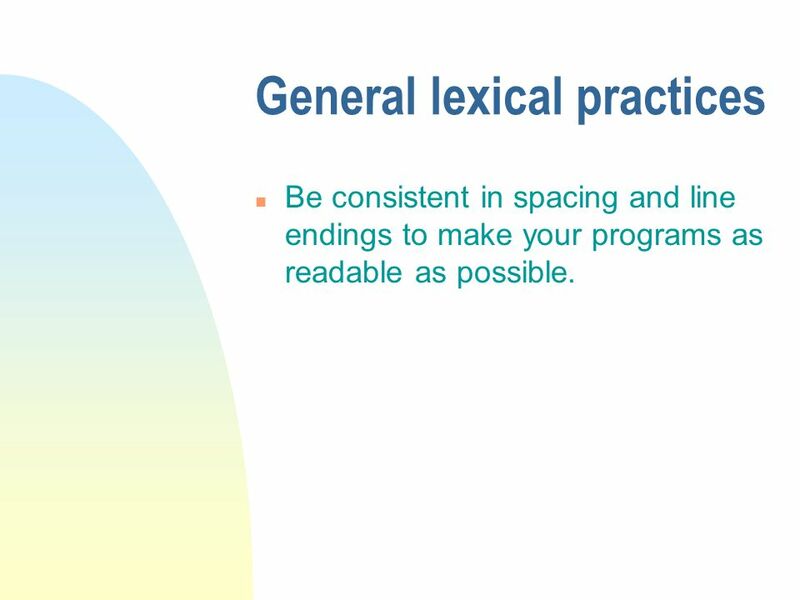 22 General lexical practices n Be consistent in spacing and line endings to make your programs as readable as possible. 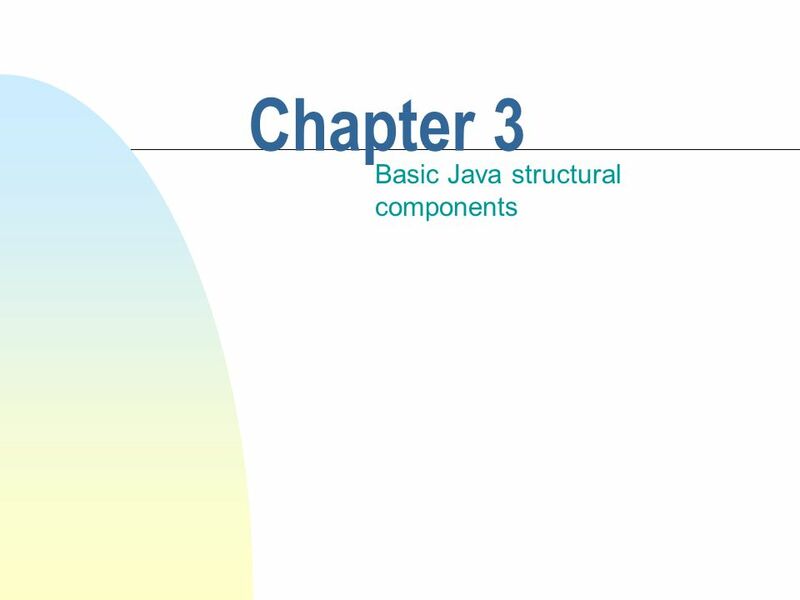 Download ppt "Chapter 3 Basic Java structural components. 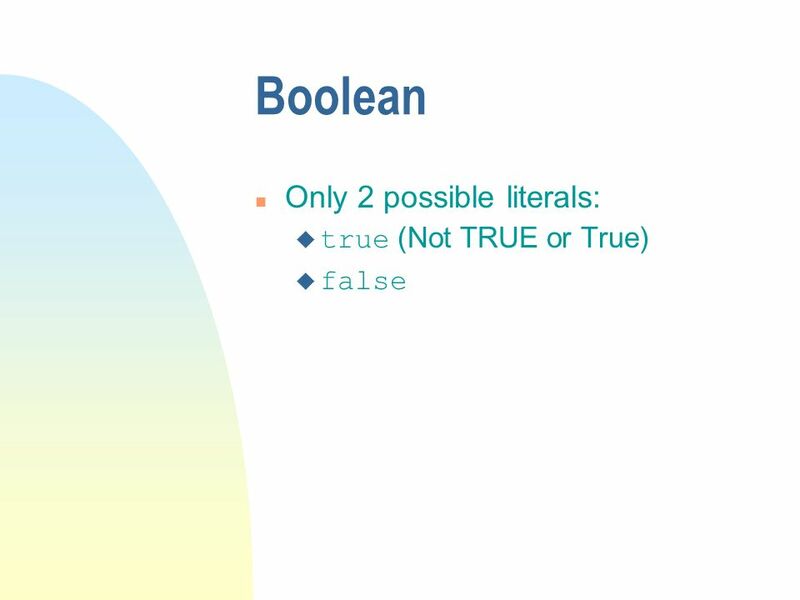 This chapter discusses n Some Java fundamentals. n The high-level structure of a system written in Java. u." 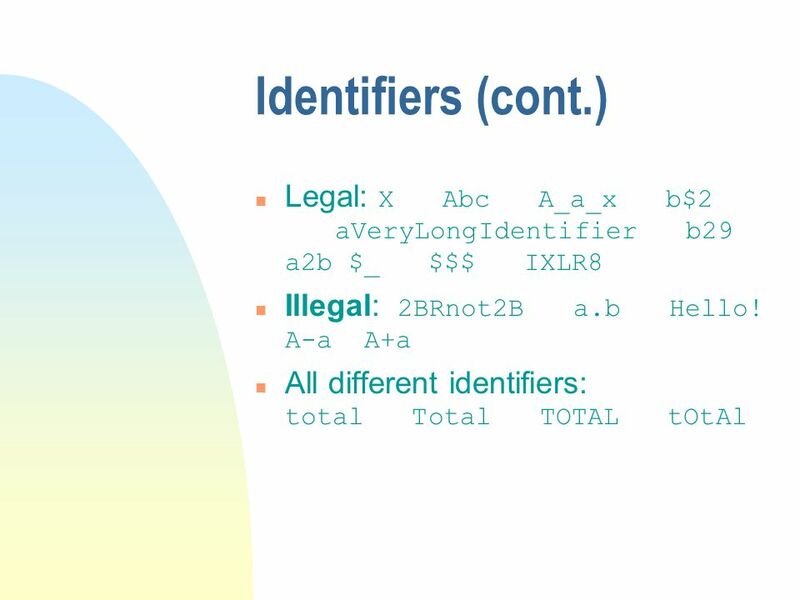 C Introduction Lesson CS1313 Spring C Introduction Lesson Outline 1.C Introduction Lesson Outline 2. hello_world.c 3.C Character Set 4.C is Case. Week 2: Primitive Data Types 1.  Programming in Java  Everything goes inside a class  The main() method is the starting point for executing instructions. Types and Variables. Computer Programming 2 C++ in one page! Bellevue University CIS 205: Introduction to Programming Using C++ Lecture 3: Primitive Data Types. 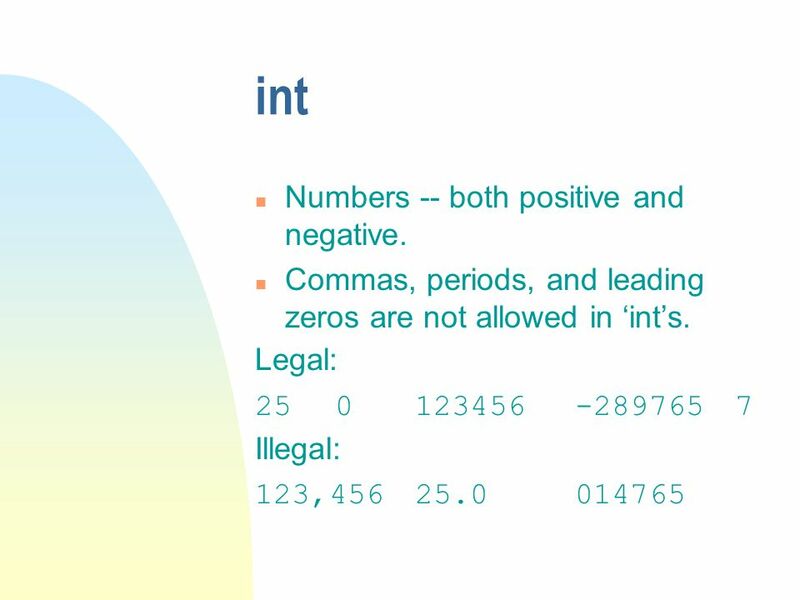 1 Lexical Elements Chapter 2 in ABC. 2 Tokens Token = word / symbol, does not contain white spaces. 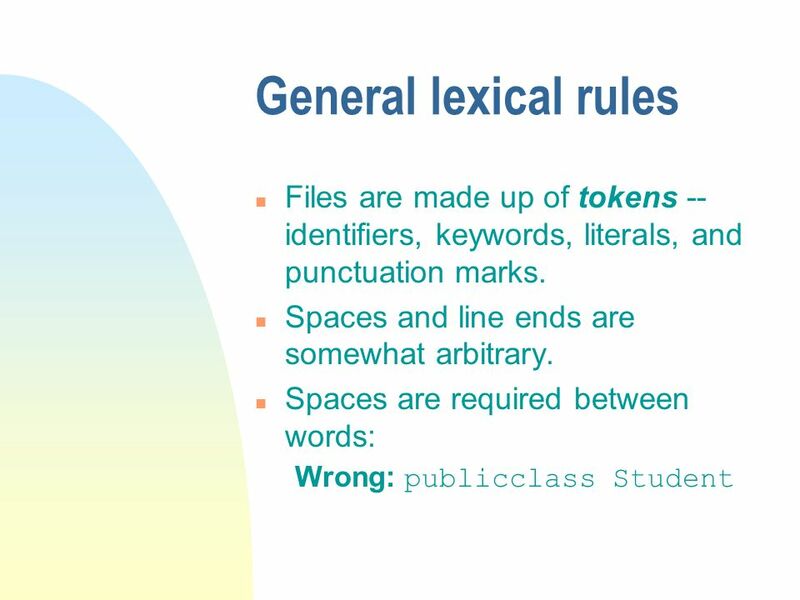 Tokens in C are either: –keywords –identifiers –constants. 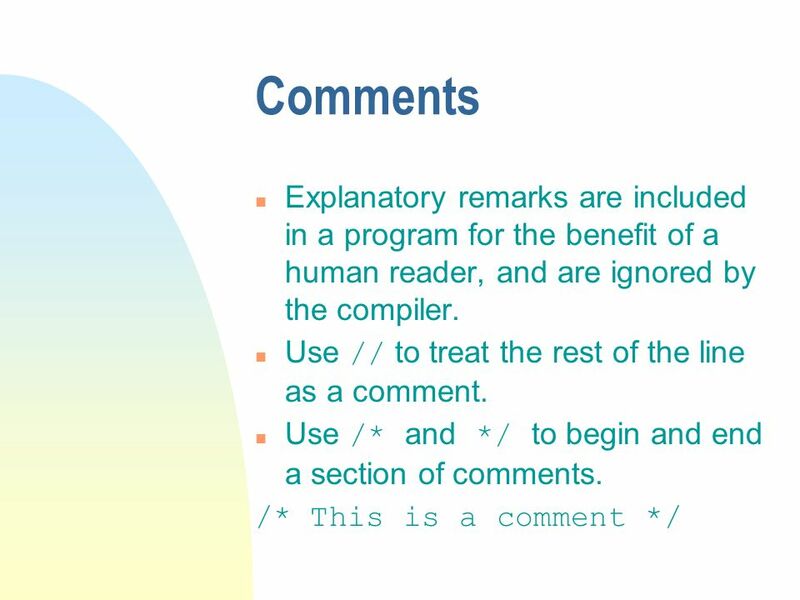 The Fundamentals of C++ Basic programming elements and concepts JPC and JWD © 2002 McGraw-Hill, Inc. The UNIVERSITY of NORTH CAROLINA at CHAPEL HILL Adrian Ilie COMP 14 Introduction to Programming Adrian Ilie June 27, 2005. Characters and Strings. 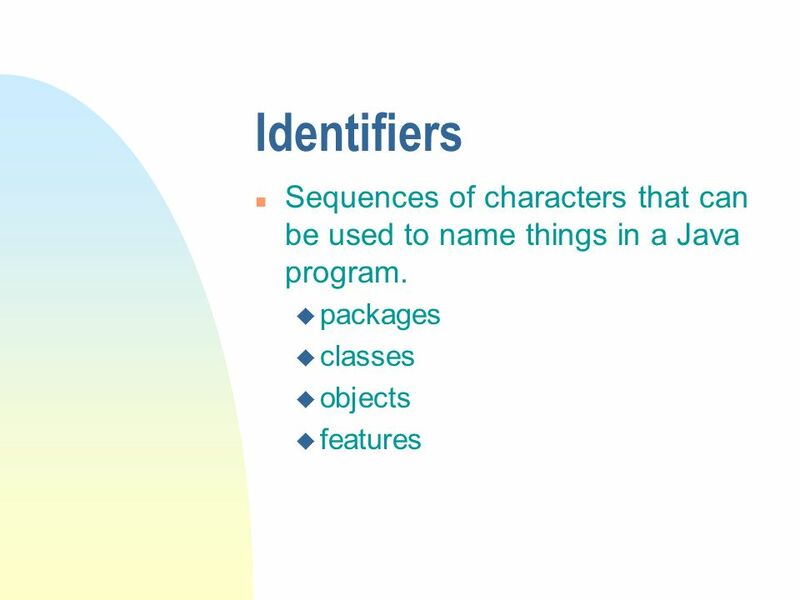 Characters In Java, a char is a primitive type that can hold one single character A character can be: –A letter or digit –A punctuation. Chapter 1 Introduction. © 2004 Pearson Addison-Wesley. 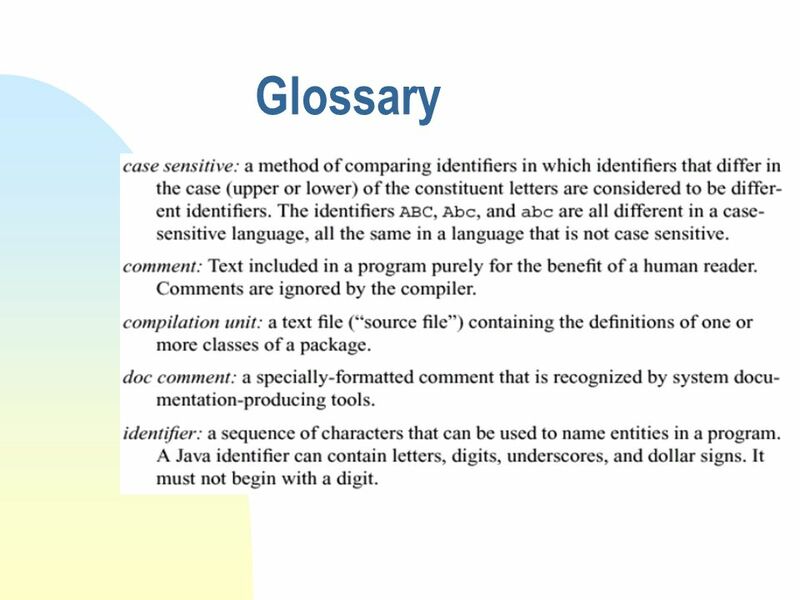 All rights reserved1-2 Outline Computer Processing Hardware Components Networks The Java Programming. 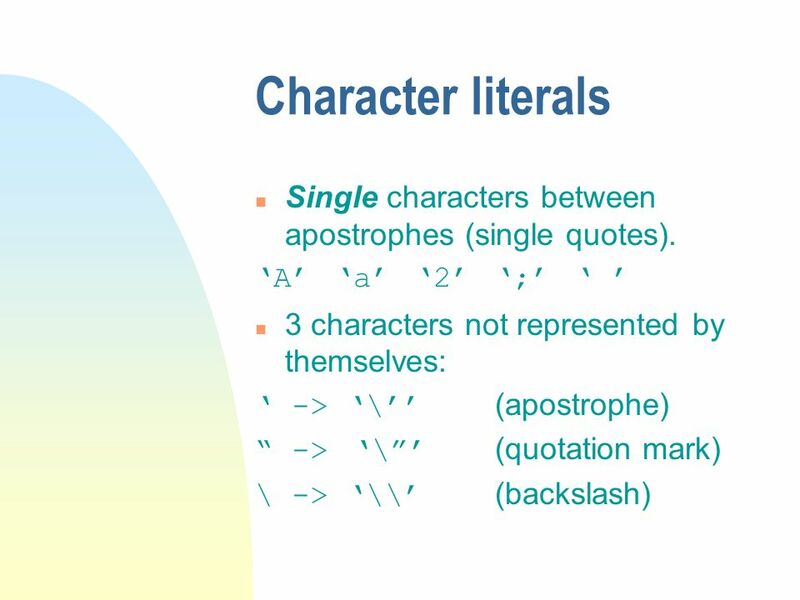 1 Lecture 3  Lexical elements  Some operators:  /, %, =, +=, ++, --  precedence and associativity  #define  Readings: Chapter 2 Section 1 to 10.